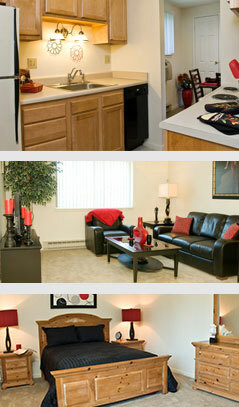 When seeking affordable apartment living, don't compromise your desire for quality. At Bradford Manor, our affordable apartments provide such quality features as luxurious wall-to-wall carpet, a/c, all-electric kitchen, ample closet space and expansive window areas to brighten your day. Laundry facilities are conveniently located within each entry hall. Just unpack! We pride ourselves in the preparations of each apartment. Importantly, to ensure your ongoing satisfaction with your Bradford Manor residence, our courteous staff takes care of your needs and make you feel a part of the community. Equipped children's play centers and picnic areas enhance this sense of community. Modern roadways provide easy access to all points in the Rochester area and excellent shopping is found nearby. Bradford Manor's community retains a unique small town feel rarely found today, within one of the area's best school systems. Excellent roads make Rochester's many employers and attractions a short drive away. Bradford Manor is pet friendly. We allow cats and most dogs. Please inquire for more information about our pet policy and regarding breed restrictions. Our cordial and professional management staff is happy to assist you, and offers 24-hour emergency maintenance service. The leasing office is open seven days a week, so please do not hesitate to contact us for further information regarding our community.